After I finished writing last week, I headed back to Bobby's Idle Hour to check out Sam's Jams, a local singer/songwriter show which is held every Wednesday from noon until 8 p.m. It really is a great thing to see, and very Nashville. The musicians were great, and I got to hang out for a little while with Sam Cooper, the host. He is a really great guy, and provided the music I used in my latest podcast, which is finally done. I ended up there most of the afternoon and evening and had a great time. After Sam's Jams, The Mighty Train Wreck did a quick set and another band followed. It is great to be in a city where you can find a whole day of great music. Sadly, Bobby's is being threatened by developers who want to tear up this and other historic properties along Music Row and put up a big high rise. I really hope the people of Nashville will stand up to it and keep this from happening. I know Nashville is a growing and modernizing city, but there is plenty of room for development elsewhere. Find My Podcast by Searching "American Anthology"
Speaking of my podcast, my latest episode is done. It took a little longer than it should have, but it really is a lot of work. If you haven't had the chance to listen to it, give it a go. If you have fast internet, you can stream it HERE, or download it at the same link. You can also find it by searching "American Anthology" on iTunes, Apple Podcasts, Stitcher or most anywhere you get your podcasts. The podcast is written by me and tells stories from the history and culture of each state I visit through 10 minute scripted vignettes. I try and give you an abbreviated but thorough account of each story without a lot of hemming and hawing. This latest episode covers some interesting stories from East Tennessee. I tell the story of one of Tennessee's favorite songs, Rocky Top, and how it went from a last minute B-side to an official State Song. Then I tell about the State of Franklin, which a majority in congress voted to become the 14th state, but never came to fruition. It was, however, a part of what would eventually become the 16th state: Tennessee. Davy Crockett was a fascinating man who lived several lives in his 49 years on this Earth, including 3 terms as a United States Congressman. In this episode, I tell you about his life and his death at the Alamo. Then comes the story of the Scopes Trial from Dayton Tennessee, one of the "Trials of the Century". The Scopes Trial pitted William Jennings Bryan against Clarence Darrow on the teaching of evolution in public schools and turned the attention of the English speaking world on tiny Dayton for 11 days in 1925. Then you'll hear the story of the Bristol Sessions, one of the first great field recording sessions, which introduced The Carter Family and Jimmie Rodgers to the world. Music historians have called it the "Big Bang of Country Music", and the story is a good one. Finally is the story of Oak Ridge, a town conceived and built from scratch during World War II, which went from farmland to the 5th largest city in Tennessee in just a year and a half. As I mentioned earlier, the podcast also features the music of Sam Cooper. It's a little over 50 minutes long this time, so when you've got an hour-long drive, give it a listen and see what you think. It's bound to be better than the news. And if you have any friends who like American history, please tell them about it too. I finished up the podcast on Thursday and published it on Friday. I also finished up some of new playlists for your next road trip to Tennessee (or anywhere really). My playlists feature songs about the state, and music by the people who hail from it. You can find my Tennessee Playlist HERE and my Memphis Playlist HERE and you can link to those playlists on Spotify from those pages. Thursday was also a very special day because my best friend back at home and his wife welcomed their first child, Mason James into the world. I am very happy to report that both mother and baby Mason are doing great. With that great news and my work done for the time being, I went out to celebrate with one of my new favorite people. At the end of my last season of guiding last year, I met a really cool young tour guide named Dani. We have a lot in common and have kept in touch, and she was passing through Nashville, so it was a great opportunity to get together and catch up. We didn't do much actually, just hung out and had a few drinks and shot some pool, but it was really great to catch up with her and to remember how hard it was when I was a young tour guide a million years ago. I think she's doing great though. The next morning I took it a little easy, but did manage to get to the gym and the library and get my podcast published. I also stopped in and picked up some Nashville Hot Chicken from Prince's, but for the last time. I do NOT like Nashville Hot Chicken, and I don't even really get it. I've had it now twice from Prince's and twice from Hattie B's and I have given it enough chances. It's super greasy, and the spice doesn't add much flavor, just heat. The whole thing leaves me feeling sick and disappointed. I think it's gross. I went out that night to drink a beer and wash the Hot Chicken taste out of my mouth, and met up with Dani and her tour group for some line-dancing at the Wild Horse Saloon. She's actually really good at it, and has been practicing through the winter. As much as I like to dance, I'm not the biggest fan of line dancing though. It's fun to watch, but I prefer dancing with people, not next to them. When Dani and her group took off, I drove down to Franklin, went to bed early and slept for a solid 10 hours - which was fantastic! Saturday was an all-around amazing day. It started at Carter House State Historic Site, moved on to Mantra Artisan Ales, Puckett's Grocery in Liepers Fork for dinner, the Franklin Rodeo and late-night music at Kimbro's Pickin' Parlor. I had so much fun and did so much that I actually wrote a whole post about the day which you can find HERE. Sunday was also a good day. I woke up and went to church at the Church of the City there in Franklin. This was only my second time visiting a "mega-church", and both have been interesting experiences. The church building was huge and modern, more an auditorium than a traditional church set-up. People come as they are, meaning I was the only one there in a tie. There was a cafe in the lobby, and the stadium seats had drink holders so you could enjoy your coffee during the service. The service started with a few songs from a rock band, complete with smoke and lights. While the songs were uplifting, and not bad, they are right down the road from Nashville. Someone needs to tell them that 8-10 minutes is too long for a song. Like I said, they were okay, but they weren't American Pie. The preacher then came onstage, a young Australian guy in jeans and sneakers, and gave a sermon. The thing is, the sermon was actually really good. He talked about the health of our souls and how this is different from the health of our bodies and minds. It was very well done, and very moving. Beyond that, everyone was really friendly, and I have nothing bad to say about my experience there. Something just didn't sit right with the whole experience, but maybe that is something in my own head. Regardless, I did get a lot out of the service and was glad I went. After church, I spent the rest of the day relaxing, reading and wandering around town. Franklin is a cute little town with a cute little Main Street. I dropped into The Pond for a drink and to sit on a couch in the air conditioning and watch some sports for a while. It was actually a very pleasant and relaxing place with a good vibe. If it weren't for the smoke, it would have been great. Then, for dinner, I headed over to Puckett's Grocery, but the downtown Franklin one instead of the original one I went to the day before. I had a Yee-Haw dunkel beer and the half smoked chicken, both of which were fantastic. The chicken was dry rubbed and smoked in-house to perfection, really a wonderful meal. After dinner, I headed back to Kimbro's Pickin' Parlor for another great night of music and great people. I really liked that place and will definitely be back again in the future. Monday I headed back into Nashville. I went out to East Nashville to check out the Five Points neighborhood and Historic Edgefield. Both were really cool. I had a slice of pizza from Five Points Pizza and then went and got a couple of hours of work done at the nice, small and quiet library there. When I was done I went to check out Santa's Pub out by the fairgrounds. Santa's is definitely one of the best dive bars I've been to. The people were unbelievably friendly, the beers were cheap and cold, and the atmosphere was pure classic dive-bar. It's a special kind of place where you can walk in and just join right into the conversation like you had only stepped out for a minute, when you've actually never been there before. It's a place where you can make new old friends fast. Once again, if it weren't for the smoke it would be perfect. It will definitely go on my list of top dive bars in the country. After a few beers, I headed back downtown and met up with another of my old tour leading friends, Don. Don has been around for a few years and has put in some long seasons on the road. It was really great to have some beers and talk shop for a while. He is doing one of my favorite trips, the Deep South and Delta Blues trip for Grand American Adventures. It's a trip I helped put together and always enjoyed running. It's full of music, culture and good food and leaves you exhausted and fat and very happy at the end of it. Don and I went for a few beers and some good music at Alley Taps, and then went and caught the end of a phenomenal songwriter show at The Listening Room. 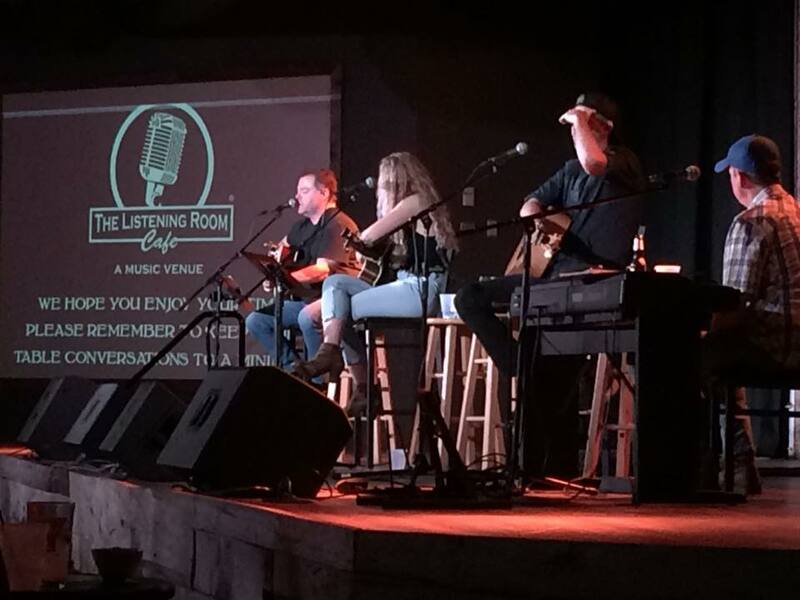 The Listening Room is a great venue and never disappoints, and this night was no different. Afterwards we went for a few more beers and a nice view of downtown at the Batter's Box, another great (and smoky) dive bar in town. We were up late, but neither of us had much to do the next day so it was a lot of fun too. I haven't been out that late in a while. Tuesday was a pretty relaxed day. I got into a hotel room for the first time in almost a month and a half. Since I needed new brakes in my van, it meant cutting my budget in other places, and the luxury of a hotel room now and again had to go. But it was definitely a much needed break and nice to be in air conditioning and be able to just hang out and relax for the day. I did get some writing done and some photos edited, but I also took a long nap and watched some television. I popped out to get some dinner at a place I've been wanting to try called Monell's in Germantown. It is a "family style" restaurant, meaning they sit you at big tables with other people and bring out bowls of food to be passed and shared. First of all, the food was outstanding. The menu changes daily, but this night included fried chicken, pot roast, spinach stuffed shells, mashed potatoes, green beans, collard greens, navy beans, corn casserole, broccoli salad, coleslaw, biscuits, cornbread, gravy, and banana pudding for dessert. It all tasted fresh and homemade, and even just taking a little of everything was enough to fill me up. You also get iced tea and lemonade and all of that for the incredibly low price of $16/person. On top of that, you get to share a meal with other people. It was a slow night and I got there late, but I got to sit with a really wonderful couple from L.A. The conversation started out slow as we made the usual pleasantries, but as the meal progressed we ended up in a long and wonderful conversation about the world, travel, politics, education and so many other topics. We actually sat and kept talking after our meal was over and until the restaurant closed down. It was so nice to sit and break bread with other people and hear fresh ideas and different perspectives. I think this is such a wonderful concept and I wish it happened more often and in more places. When we sit down with people and really talk, we will always come away better people. I would give Monell's my highest recommendation for the food alone, but the atmosphere and exchange of ideas make it even better. Needing to walk off some of my amazing dinner, I headed back through the Bicentennial Park which has a wonderful wall which tells the entire history and pre-history of Tennessee. I saw all of the stories from my last podcast mentioned, and so many other things as well. What a wonderful idea and a wonderful display of the history of the state. It also didn't seem to pull any punches, making mention of things like the Indian Removal Act and school segregation right alongside the Bristol Sessions and Davy Crockett. I really liked it. It led me back to the State Capitol building, a building I've been in a few times and really enjoy. It's also the final resting place of President James Polk. I think it's interesting that all three of Tennessee's claimed presidents (Polk, Andrew Jackson and Andrew Johnson) were all actually born in North Carolina (which also claims them and also has a statue of them at their State Capitol). After my visit, I dropped down to Layla's on Broadway for a few quick beers and some good old country music. And now it is finally time to leave Nashville and head west. This coming week I hope to head down the Natchez Trace Parkway and then cut up to Jackson. From there I will make my way down to to Memphis and then head north along the Mississippi River in the far west of the state. I'm looking forward to tracking down the story of Casey Jones for my next podcast, and exploring the Civil War a little more at Shiloh. Of course I am also looking forward to some amazing Memphis-style barbecue and some great blues music as well. What are your plans for this week? I hope you are making some as this spring weather isn't going to last forever. Get out and enjoy it wherever you are. Until next week then, I'll be seeing you down the road.